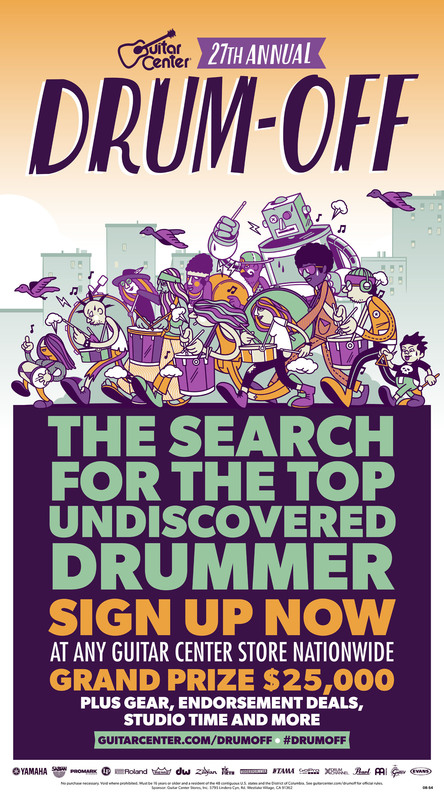 Westlake Village, CA (August 3, 2015) – Guitar Center’s Drum-Off, the world’s premier drum competition, launches its 27th annual search for the next great undiscovered drummer. Developed to inspire and support aspiring musicians, the program has grown into a sought-after launching pad for a career as a professional drummer. Past Drum-Off winners have gone on to play with Prince and Beyoncé (Cora Coleman-Dunham), The Mars Volta and Trash Talk (Thomas Pridgen), Jay-Z (Tony Royster Jr.) and many more. As Guitar Center’s longest running artist discovery program, Drum-Off continues to unearth some of today’s top undiscovered drummers and provide an unrivaled platform for exposure. Starting today, drummers can sign-up for Guitar Center’s Drum-Off at any of the retailer’s locations nationwide. Free and open to drummers across the country, entrants will compete for a chance to win a career-launching grand prize package valued at over $45,000 including cash, gear, endorsement deals, and more. Guitar Center Drum-Off is presented by: Roland, Yamaha, Meinl, Remo, Pearl, Vic Firth, DW, LP, Gretsch, Zildjian, Evans, Promark, Sabian, Tama, Drum Channel, GoPro, and Modern Drummer.